…Now what do we cut? 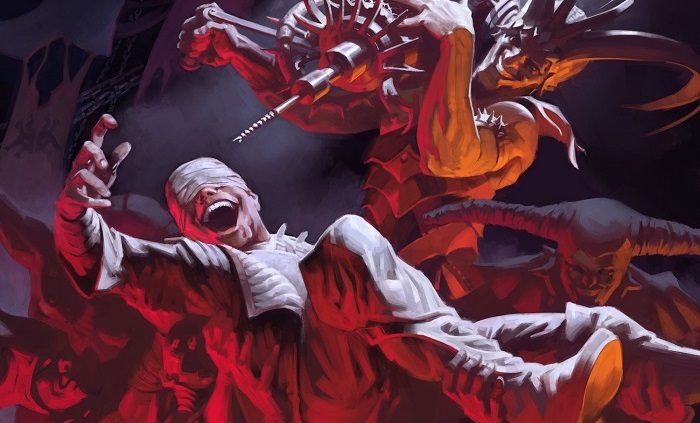 Last time on Making the Cut, we discussed Theater of Horrors and what a massive boon it can be to run cards that act as pseudo-commanders in your EDH decks. As a refresher, here is the full decklist, which focuses on discarding enemy hands so they’ll be forced to use Xantcha, Sleeper Agent‘s ability. Theater of Horrors was just one of the many new Rakdos cards that look amazing for this deck’s Discard strategy, allowing us to cast spells even while discarding all our cards! Given the breakneck speed at which Wizards of the Coast has been printing cards obviously meant for the Commander format (or at the very least the Brawl experiment), surely Theater of Horrors is not the only goody to come out of Ravnica Allegiance that might help out our Xantcha, Sleeper Agent adventure in discard and group misery! So what other cards can we look at for possible inclusion from the new set? 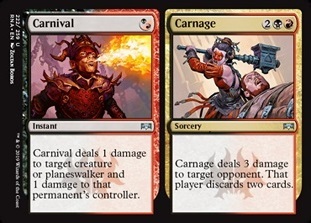 There were a lot of new Rakdos cards from Allegiance that really fit well within the Discard/Group Slug deck strategy, but really none of them fit it better than Captive Audience. Playing this seven-mana enchantment allows us to target the blue deck at the table, the one still drawing cards despite all of the discard effects we have out. It might also provide us with blockers in a creature-light deck, and if they choose the life-dwindling option, will even allow us to treat an opponent as if they were basically already dead. To a lesser extent than Theater of Horrors, Captive Audience also does one of the major jobs of our commander as well. While it’s easy to get distracted along the way, the primary focus of Xantcha, Sleeper Agent is to try and burn an opponent out (with a little help from our friends). Captive Audience‘s “Your life total becomes 4” ability provides a more efficient capability to achieve that goal, and can even have a meaningful effect on that lifegain deck that has been keeping you from playing Xantcha at all. While the seven-mana price tag is hefty, it’s nothing compared to the mana we’ll have to pump into Xantcha while attempting to take out the Archenemy at the table. Still, because the ultimate goal here is to make people discard a lot of cards and take damage as a result, it’s more important in this deck than in most to keep our mana costs down so we can keep casting spells and drawing cards with our commander. Rather than adding too much to our curve, let’s look through our most expensive spells to try and find a slot for this addition. Torment of Hailfire has many of the same arguments as Death Cloud, but doesn’t affect us at all and can really do some damage to all of our opponents for minimal mana if we’ve succeeded in emptying out their hands. Sire of Insanity will simply force all players to discard their hands, period. Etali, Primal Storm is a bit expensive, and we have no way of giving it haste. We are creature light, however, and it’s not like we can cut it for being expensive and then put in a more expensive card. Scythe Specter is not exactly knocking it out of the park, but when compared to the new The Haunt of Hightower, we can actually go ahead and make that swap right away and move on! Memory Jar has been banned a time or two, and for good reason. While five mana is a lot for a wheel effect, in the discard deck, it does double duty. Activating it during our turn means only we get the chance to cast any spells (barring instants, of course). Plus, imagine if you have Megrim in play. Cutting Gilded Lotus while we’re trying to keep mana costs down and are adding a more expensive card would be a little silly. Fraying Omnipotence is probably the best Pox effect in the deck. In fact, during initial deck construction, I directly compared the two and decided that Fraying Omnipotence was better in a two-color deck. This is a great sacrifice outlet for when Xantcha eliminates its controller and winds up back in our possession, or it can just be a great way to get life totals down so we can burn someone out (while also getting rid of a lot of their threats and some of their hand). Void is a jack of all trades, master of none. It only makes one opponent discard, it doesn’t really excel as a board wipe, and it’s also rather expensive for pinpoint removal, even if it can get around hexproof. This one is definitely worth considering alongside Death Cloud. Archfiend of Ifnir is another staple in the discard strategy, so much so that it actually shows up as the card describing the strategy on the EDHREC Themes page. It enables one-sided board wipes every turn it stays in play, and flies overhead for five damage. It’s just too good to consider removing here. So, having gone through the full list of high-cost suspects to cut, we have two options that jump out: Death Cloud and Void. Both can be an excellent means to control the board while also getting some bonus discard, but I think in this case Void is the easy cut. While it is our only means of removing artifacts in the deck, we’ve tried to tune down this aggressive Group Slug strategy to a lower power level by removing interaction outside of the main strategy, and I see no reason not to continue doing so. Even in the case that we were to power it up, there would be better options to destroy problematic artifacts than Void. With that in mind, we’ll go ahead and cut it for the superior effect of Captive Audience. Unlike Void, it won’t destroy a problem, but it very well may destroy the player controlling it. Given that the total number of creatures in the deck comes in a little light, at just 21, let’s start by considering just the noncreature options. It would seem that the easy cut here is Blightning, as it only targets a single player, as opposed to the other spells that affect all opponents. However, in similar fashion to the quick swap we made with Scythe Specter, Blightning now has its fellow Carnival/Carnage for a direct swap. The Blightning effect itself in the Carnage half of the split is more expensive, but that seems like more than a fair trade for the flexibility to damage an opponent while removing one of their utility creatures. So, that brings us down to just the one-shot Vicious Rumors or the conditional Pain Magnification. This seems like an extension of the classic Phyrexian Arena vs. Read the Bones argument. We’re either talking about the immediate satisfaction of having everyone discard a card, or the possibility of opponents discarding card after card over several turns. While Vicious Rumors is rather looked down upon in competitive play, and definitely doesn’t compare to Smallpox in scope, it does affect each opponent in both life and cards. Those are the exact zones we’re trying to manipulate, so it does everything we need it to do, albeit in smaller amounts than we’d like. Pain Magnification, on the other hand, gives us no guarantee of cards discarded on its own, and with its three-damage requirement, does not combo with either our commander or most of our smaller creatures. Even our bigger effects usually cause opponents to lose life, rather than take damage, which bypasses the Pain Magnification trigger. Indeed, looking through the deck, there are only two total effects outside of combat that can trigger Pain Magnification, one of which is the ultimate on our only Planeswalker, Chandra, Torch of Defiance. Given that lack of reliability, we would be leaning a lot on other players, our commander’s attack step, and our own creature-light attack steps to trigger it. With that in mind, I would lean toward cutting the enchantment here and keeping the possibility of a turn-one discard alive. That said, what would you do? What would you cut for Captive Audience: Death Cloud or Void? And what would you cut for Awaken the Erstwhile: Vicious Rumors or Pain Magnification? Lastly, what do you have roaming around unsleeved in the side of your deck boxes? What decks do you want to add things to, but just can’t find the room? Let us know in the comments so we can help each other get to our best 99! Doug has been an avid Magic player since Fallen Empires, when his older brother traded him some epic blue Homarids for all of his Islands. As for Commander, he's been playing since 2010, when he started off by making a two-player oriented G/R Land Destruction deck. Nailed it. In his spare time when he's not playing Magic, writing about Magic or doing his day job, he runs a YouTube channel or two, keeps up a College Football Computer Poll, and is attempting to gif every scene of the Star Wars prequels.